The EFL's 2019 Day of Action took place on Tuesday with all 72 clubs coming together to highlight the work undertaken to tackle some of society’s biggest issues. EFL clubs across the Sky Bet Championship, League One and League Two hosted a range of events designed to showcase the very best of their work to tackle a diverse range of social issues, from homelessness and mental health, to community cohesion and the battle against plastic pollution. Portsmouth legend Alan Knight cooked up a storm as he joined a Pompey in the Community initiative, designed to teach recently divorced or bereaved men, how to cook and do so on a budget. The Day of Action is simply a showcase for the extensive community work EFL clubs do every single day of the year, says the organisation’s chief executive Shaun Harvey. 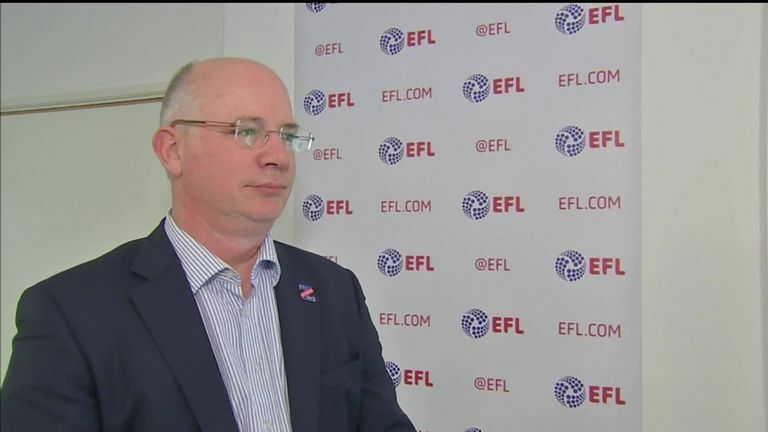 EFL chief executive Shaun Harvey hosted a journalism workshop at a Brentford primary school, where pupils got the opportunity to put the tough questions to him in a mock news conference. Meanwhile, Brentford duo Neal Maupay joined defender Julian Jeanvier for a grassroots football coaching session in nearby Southall. Here's what happened when Albert Adomah took to the streets of Birmingham as part of @AVFCFoundation’s #EFLDayOfAction activities. In Birmingham, Aston Villa midfielder Albert Adomah distributed essential items to rough sleepers in Birmingham. Colchester took the opportunity to share a new project they have begun delivering across Colchester and north Essex, aimed at tackling and preventing knife crime. More than 4,000 young people from over 20 primary and secondary schools across Essex have already attended the club's United Against Knife Crime programme. EFL Club Community Organisations represent the largest network of sporting charities in the UK. Last year the EFL and its clubs invested £80m back into local communities.